Last weekend we once again camped at Jones Lake State Park as part of an exploratory trip to the Green Swamp and surroundings. As we drove in, the campground looked quite different from last year at this time – it had been burned. The park staff do periodic prescribed burns to mimic the natural occurrence of lightning-caused fire in these habitats. After setting up camp we walked over to the canoe access area to check out the lake. On our way back, I noticed a speck of bright green in the brown and black landscape resulting from a January prescribed burn. A freshly emerged luna moth! Our first sighting of this beautiful moth of this season. It was hanging still, no doubt getting ready for its first flight. I ran to get our cameras and we spent the next 30 minutes observing and photographing this beautiful creature. The long tails are a gorgeous and diagnostic feature of this species. And, according to recent research, they serve a potentially life-saving function for these giant silk moths. When flying, the fluttering tails appear to create an acoustic signal that causes hungry bats to zero in on the moths’ tails, missing the vital body parts, and allowing many moths to escape. When you only live a week or so as an adult, every miss from a predator seems to have added importance for your reproductive success. 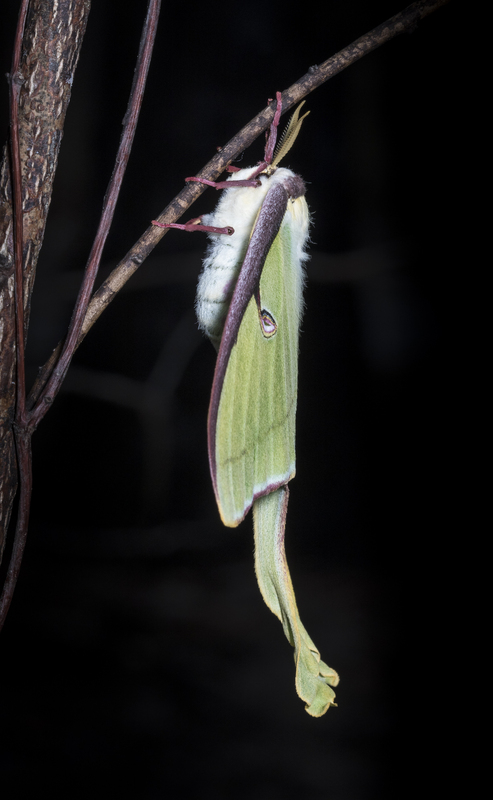 Female luna moths scatter their couple of hundred eggs on host plants such as sweetgum (the dominant in our area), persimmon, and hickories over the few nights of their active flight. There are generally at least two generations per year in our area with the Fall generation overwintering as a cocoon. The Fall caterpillars wrap themselves in leaves and silk and are usually hidden in the leaf litter until they emerge in spring. And that is what piqued our curiosity with this particular moth. How had it survived the ground fire just a couple of months ago? I started searching the area around the moth, figuring it had climbed the first vertical object it encountered after emergence. They climb in order to fully expand their wings by pumping fluid from their abdomen through the veins of their wings. Moths that don’t hang from something (like those placed in a glass container as cocoons) may develop deformed wings and cannot fly. After just a minute of looking, I found the cocoon laying on the now almost bare ground about 3 feet from the sapling the adult had climbed. 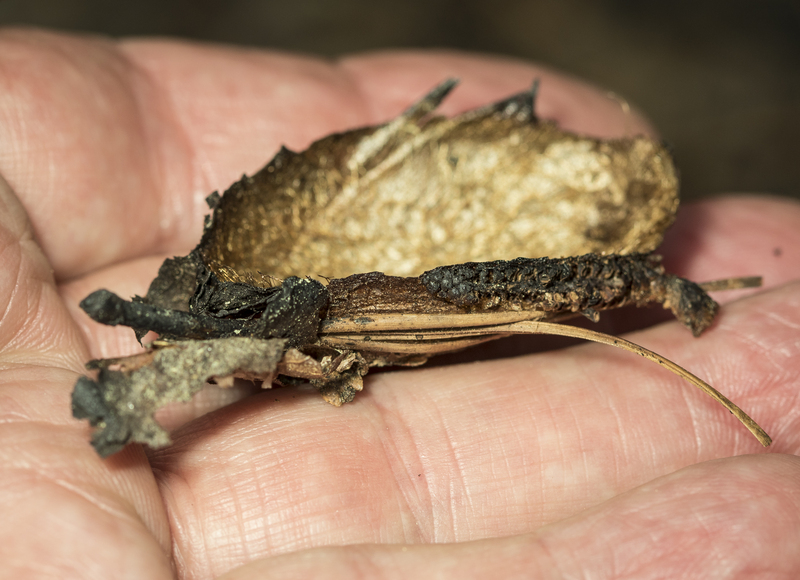 When I picked up the cocoon, I was stunned to find that half of it was missing, presumably consumed by the fire (note the seared edge). 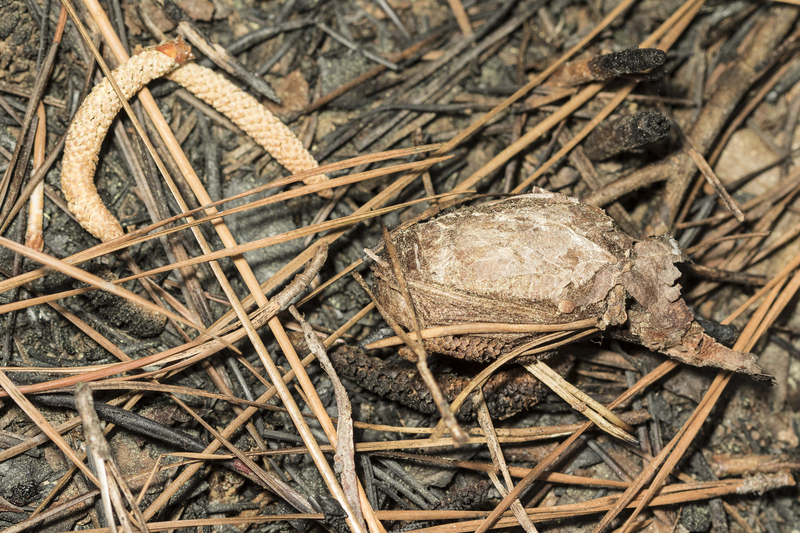 We can only guess that the pupa inside the cocoon somehow managed to escape the fire that consumed half of its covering. It then lay there for a couple of months, lucky to escape foraging insects, mice, and other pupa predators. Truly amazing. 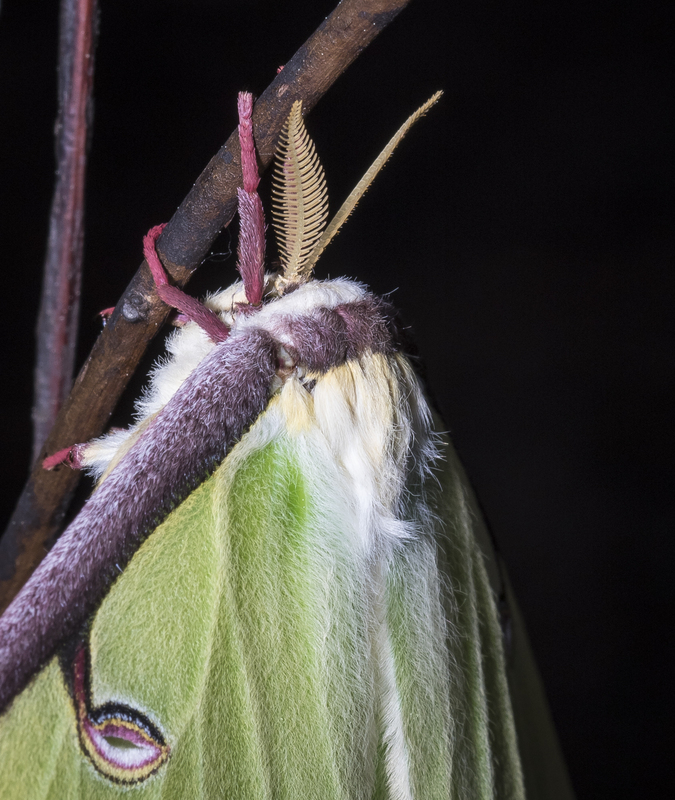 An equally amazing thing is how an adult luna moth normally escapes its silken cocoon. You usually find a spent cocoon with a single hole in one end. 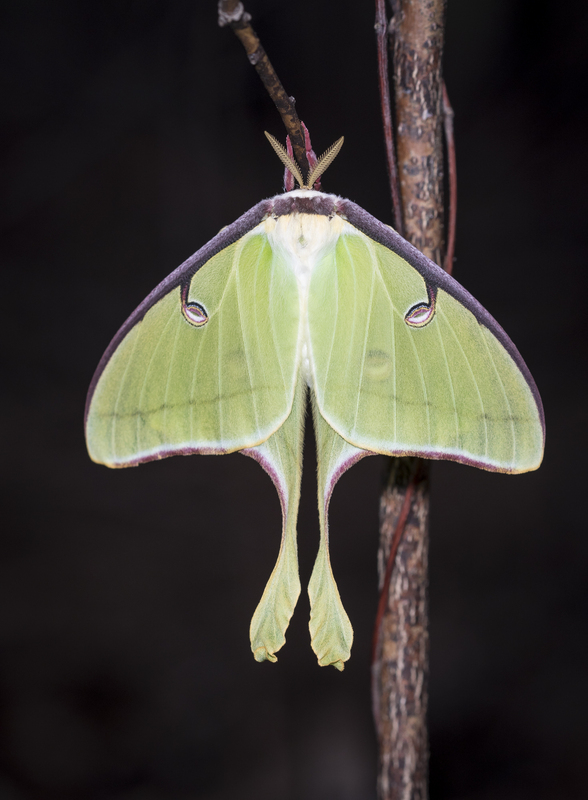 The adult moth wriggles out using a secreted enzyme (called cocoonase) that helps dissolve the glue (called sericin) binding the silk in the cocoon. The moths also have shortened spurs along the base of the fore-wing that are used to help tear through the cocoon covering. As we moved around it taking pictures, I accidentally touched the sapling, causing the moth to raise its wings, exposing the stunning eye spots on the hind wings. It also started to quiver slightly. These shivering motions are generally a precursor to flight, but it quickly settled back to a resting position and we moved on. When we checked the next morning, the moth was gone, hopefully to live long enough to ensure a new generation of these magnificent insects. 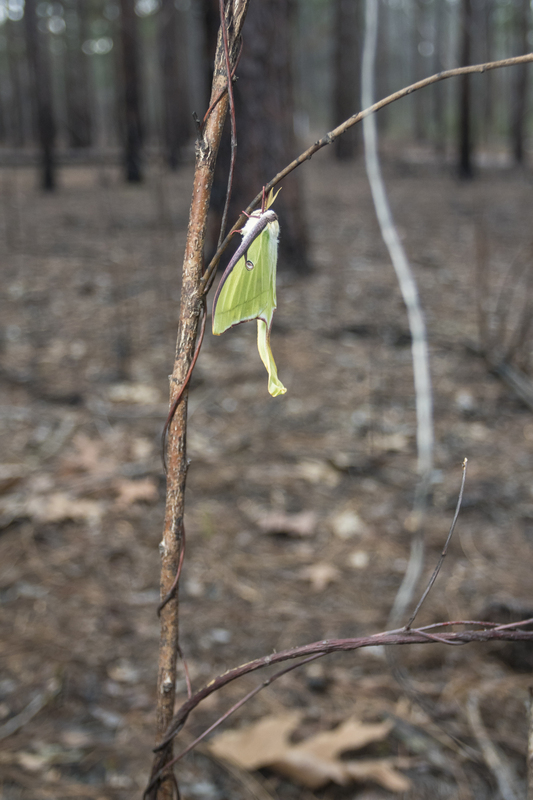 This entry was posted in Natural History, Trip report and tagged cocoon, luna moth, prescribed fire by roadsendnaturalist. Bookmark the permalink. a pleasure to read, and see. 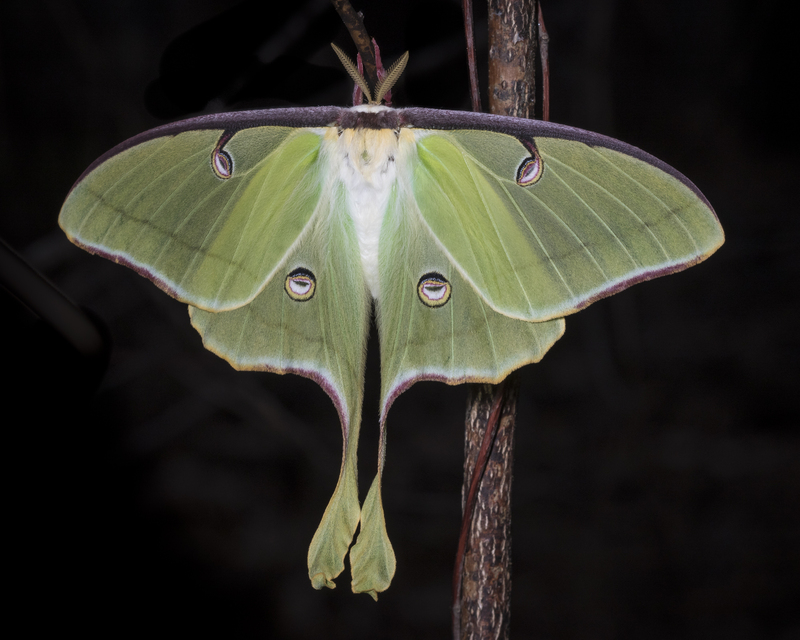 I have always loved Luna Moths, so this was a treat! Thanks, Mary. I agree with you, one of my favorite insects. I remember seeing pictures of these when I was a kid. They seem to be too big to fly! They are both delicate and ungainly in appearance. As always, great pics and an engaging narrative. Thanks Mike! Appreciate the kind words, John. I’m going to look around our woods and see if I can find one as well. We did see one last year. Happy ending given that the cocoon was fire damaged!